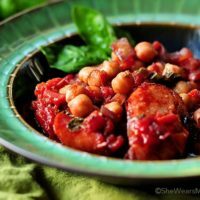 This delicious Italian Style Garbanzos and Sausage Recipe is a great weeknight meal that is quick and easy to make. Easily adapt for a meatless version if desired. Do you have regular standbys for those last-minute-throw-it-together-in-a-wink dinners? A can of green beans used to be our typical go-to for a quick side dish, but lately it’s been a white bean sauté. It’s quick and full of flavor, and I usually have a stockpile of cannellini beans on hand. One evening last week we were running behind schedule for supper. So while Randy was heating up the grill for salmon and chicken, I began the routine sautéing of the onion and garlic – one of the best aromas ever – and headed to the pantry for the cannellinis. What?!? No cannellinis? But I thought I saw … garbanzos. A stockpile of garbanzos and no cannellinis in sight. Yeah, hummus is always yummy, but I had onions and garlic waiting on the stove. I decided to toss them in anyway. As I was grumbling to myself about my apparent failure of pantry stocking skills after having just discovered six bags of dried cherries the week prior, I noticed a recipe on the can of garbanzos. I don’t know why I forget to refer to packaging for recipes. Many of the recipes found on labels are really good. My daughter’s favorite cookie recipe is the oatmeal chocolate chip cookie from the lid of the oatmeal container. The one I discovered on the can of Bush’s garbanzos was one for Italian Style Garbanzos and Sausage. It looked easy enough, and, it was a miracle, I did have (kinda, sorta) everything on hand. Supper for the next evening? Done. I made a few adjustments. I added garlic and replaced the seasoned diced tomatoes that were called for with whole canned tomatoes and fresh herbs from our garden, as well as the addition of olive oil, and salt and pepper. It was quite hearty and satisfying. Plus, garbanzos are packed with fiber and a good source of high quality protein. But get this, garbanzo beans (chickpeas) also contain a high percentage of the trace mineral molybdenum. Molybdenum? What the?!? Yeah, I didn’t know what it was either, but apparently (according to this article) molybdenum is an integral component in helping to detoxify sulfites. Sulfites are used as a preservative in many foods, and if you’re sensitive to them it may mean your molybdenum levels are too low to help detoxify the sulfites. So eating more garbanzos is not only yummy, but helpful too. Eat more garbanzos my friend. Let’s get started. 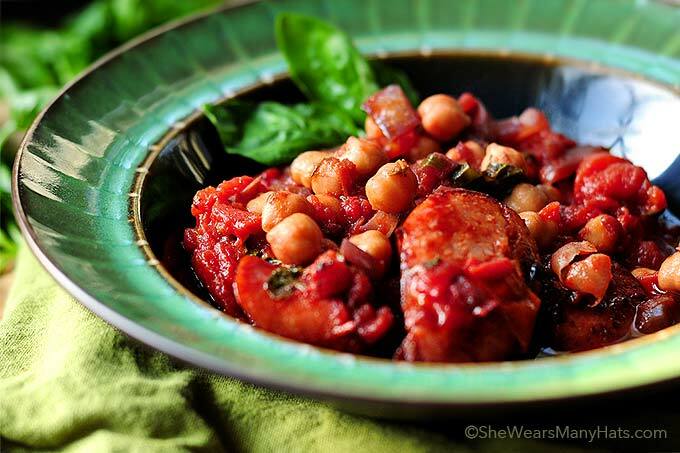 Here’s what you’ll need … smoked sausage, olive oil, onion, garlic, red wine, canned tomatoes, garbanzo beans (chick peas), fresh herbs, salt and pepper. Begin by chopping up the onion, garlic and herbs. Next cut up the smoked sausage in 1-2″ sections. Or 3/4″ sections. Or 2 1/4″ sections. Just cut it up however you like. It doesn’t much matter. Here’s where I goofed. Well, kinda. Sorta. Maybe. Not really. It worked just fine, but if you want to cut down on dishwashing, don’t do like me. I began by sautéing the onion and garlic, but what you should do is begin by browning the sausage for a few minutes over medium heat. Remove the sausage from the pan and add 1-2 tablespoons of olive oil to the pan to just coat the bottom of the pan. Then sauté the onion and garlic over medium heat until slightly transparent being careful not to burn the garlic (burnt garlic = ick), about 5-7 minutes. Then in goes the red wine. 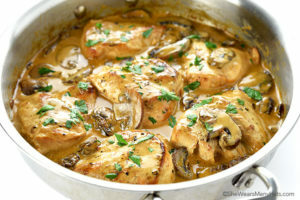 This will help deglaze the pan, or, in common terms, “get all the good stuff off the bottom of the pan.” Simmer the onion, garlic and wine for a few minutes until it reduces a little. After the wine has reduced, add the tomatoes, garbanzo beans (drained) and chopped herbs. Oh, and don’t forget the salt and pepper, then bring it all to a simmer. You could add the smoked sausage back in at this point. If you want to add it now, add it, if not, don’t. You’re free! You are the commander of your kitchen, and the ultimate decider (one who decides) of when the sausage hits the pan. Also, since I used whole tomatoes, instead of diced, I mashed up the tomatoes just a bit at this point. Next, if you haven’t already, add the browned smoked sausage back to the pan. Simmer for 15-20 minutes to reduce down. Sauce will thicken slightly. And that’s it! You’re ready to enjoy. This savory dish can be made ahead, then refrigerated covered until ready to reheat or keep warm on low or in a crock pot for hours. This is a great throw together meal for those cool fall evenings when you’re in a rush. For a vegetarian version, I’d drop the sausage (of course) add another can of cannellinis, in addition to a smoky chili powder, like ancho chili powder and maybe some cumin – yum! This hearty and flavorful Italian style stew is easy to prepare and perfect for any night of the week. Begin by chopping up the onion, garlic and herbs, and cut up the smoked sausage in 1-2 inch sections. In a medium size skillet or sauté pan, brown sausage for a few minutes over medium heat. Remove the sausage from the pan and set aside. Add 1-2 tablespoons of olive oil to the pan to just coat the bottom of the pan, and sauté the onion and garlic over medium heat until slightly transparent, about 5-7 minutes. Next, add the red wine. Simmer the onion, garlic and wine for a few minutes until it reduces a little. 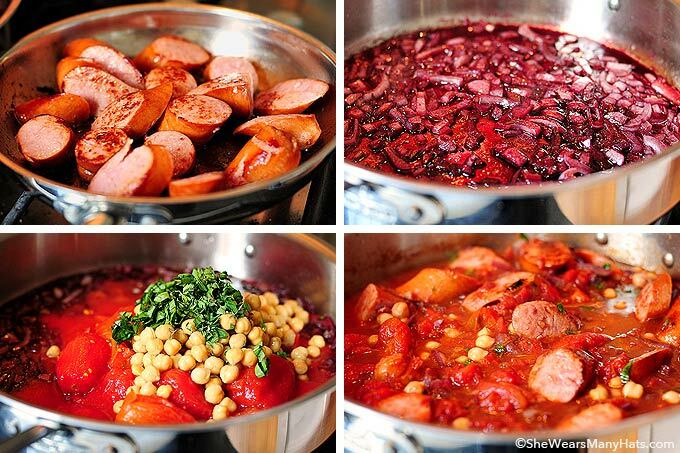 After the wine has reduced, add the tomatoes, garbanzo beans (drained), chopped herbs, salt, pepper and browned smoked sausage. If you’re using whole tomatoes instead of diced, mash them up just a bit at this point. Simmer over medium heat for about 15-20 minutes. Sauce will thicken slightly. Originally published September 7, 2010. I heard somewhere that the recipes on the backs of packages are sometimes the best recipes! 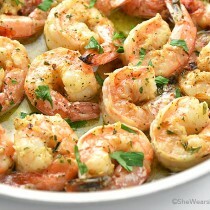 Do you know about Kathy’s blog: http://www.CookingontheSide.com? She blogs package recipes. Josh will really enjoy this one. Anything with sausage and he is sold! So yummy, Amy! I think the recipes on the side of the Bush’s cans are always good. I’ve yet to have a #fail with those! I am not a sausage lover, but the Mr. would go bonkers for this. What an amazing dish. And nothing beats how easy it is to prepare. Love it! My Garbanzos always turn into Hummus! I may have these ingredients at home in the pantry. I am giving this one a try! My kind of dinner, Amy! Hearty, rich, satisfying and one pan to clean 🙂 You’re so right that the recipes on the backs of the boxes, bottles, cans and jars are sometimes the very best. And this one looks like a real winner! I can’t tell you how many times I’ve started cooking a meal only to realize I’m lacking the main ingredient(s) and need to switch gears mid-stream. But it rarely troubles me since, like you here, I often I make some of my best kitchen discoveries in that ad lib way. This is an excellent, hearty, early fall dinner recipe. Many thsnks for sharing it with us! Love your new comments look by the way! Very clean and sleek. I will voluntarily, gladly eat more garbanzo beans if it means I can drink more wine. I’m going to have to try this one! I think I might have actually saved it already. Bush’s definitely has some good-sounding recipes. 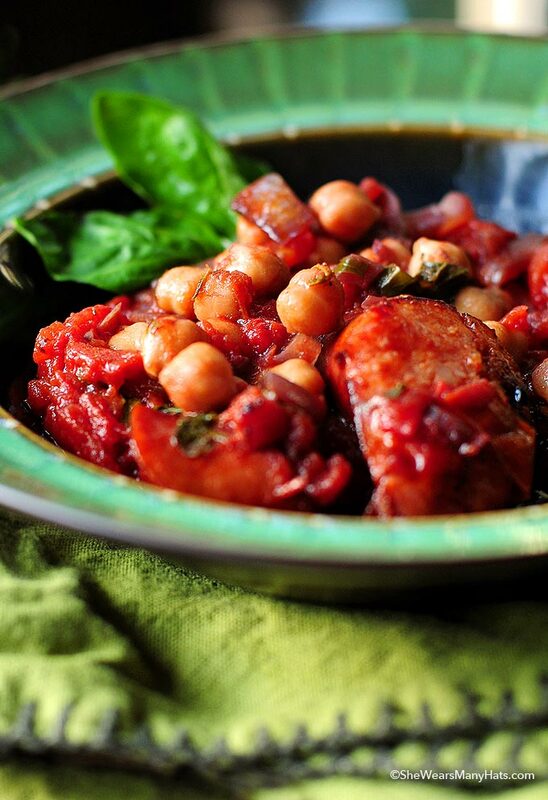 I have a serious chickpea addiction… And this dish… Looks. Amazing. Thanks for the inspiration! yummy and easy! Can’t wait to try it! I think I just craved winter when I read this recipe! Looks easy and delicious. 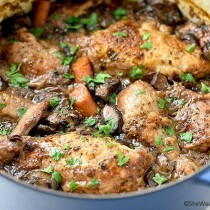 I love these kinds of one pot dinners. It looks like such a great, comforting meal! Now this is my kind of meal – quick, hearty, and tasty. I love the bowl in the first photo! Amy, pics are fantastic, as usual! The food is so not me, but is SO my husband. He would worship me if I could cook like you! 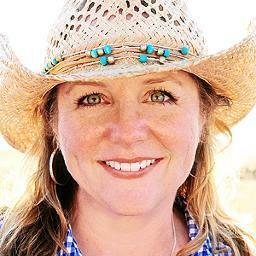 Amy, I love your site! Your pictures are beautiful hopefully I get that good someday. It was great to meet you and Robyn at the FBF, it’s so inspirational to have some many women (and a few men) in one place who are doing great things. Hope to keep track of one another. This was a great way to serve up a quick dinner & I must try it. Love garbanzo beans and of course big chunks of sausage. This meal will be great for the upcoming cooler seasons. This really is a great recipe especially for those of us who are real garbanzo bean lovers! And I always cook the meat first in the same pan as it adds more flavor to the finished dish. This is a rich, hearty meal that is quick and easy! Love it! I used to hate chickpeas. Couldn’t even look at them. I don’t know what changed my mind but now I love em and I’ve always loved Italian sausage. This looks and sounds terrific especially with the cold weather (yuck) coming. LOVE this go to meal. I always keep chickpeas on hand for these easy peasy dinners. I should really keep sausage in the freezer as well, would be a nice addition. Delicious step by step photos! Yes! More garlic! I’d be lost without it. I went by a Bush’s plant in TN this weekend and thought of you! 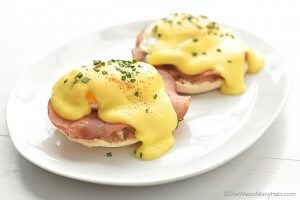 Hi Amy, this is Diana from TasteSpotting! 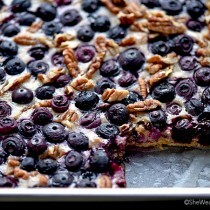 I just found your website through Tastespotting, and I have to say, your recipe looks fabulous! I’ll be making it this week! I also adore your prose PERSONALITY (IS THAT A LEGITIMATE TERM? iT SHOULD BE.) . wAY TO CREATE A MODEL BLOG! i LOOK FORWARD TO CHECKING IN OFTEN! Hey, Amy. I found your recipe after I had the exact experience you describe. I had looked up a recipe for cannelini beans, grabbed a can from the pantry, poured them in a bowl and thought: those aren’t cannelinis – those are chick peas! Of course that was after I had poured in the second can. I figured, what the heck, they’re white, and went ahead since as you did, the onions and sausage were already in the skillet. Here are my modifications: instead of tomatoes, I poured in probably 2 or 3 tablespoons of catsup and cooked up a bunch of broccoli and mushrooms to add in as well. No oil or additional spices because of the oil already in the sausage. Combined it all in a largish microwave bowl and nuked the cooked sausage, onions, mushrooms, broccoli and drained beans for 5 minutes on medium. Delicious combo! am enjoying right now. Googled it Sausage and chic pea- and this was one of the top 5 found. I have had this can of beans in cabinet for a while and bought sausages on sale. I wanted basically carb free dinner, with the ingredients i had in the house. Wow! Simmering now tasted it 3 times”) Amazing. 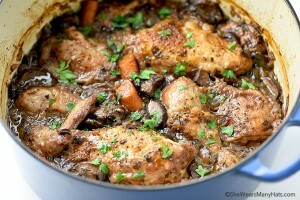 Changes white wine, touch of balsamic ving to deglaze, added shallots, carrots and celery to increase veggie intake. Fresh tomatoes &1/2 of jar of tomato sauce instead. OMG! So glad you like it Eric! And your changes sound delightful! Will have to try those next time. YUM! I make something similar to this with chicken sausages and black beans, and it’s one of our favorite easy weekday meals. This looks fantastic, Amy! Oooh … that sounds delicious. I like black beans with anything! This is so colorful and looks yummy! Perfect for a snowy day like today. I wish we had some snow. Wanna trade? I just made this recipe. It was delicious and smelled wonderful. I was getting visitors (my family) in the kitchen while making it. They said it smelled so good. Easy to make and now one of my favorite recipes. Thank you. .
It’s certainly an appetite inducing aroma! Glad y’all enjoyed it. This sounds delicious–looking forward to trying it! I hope you enjoy it, sweet Susie!